HomeSlice gives roommates instant access to the pulse of the house. Collaboration is critical for happy housemates. HomeSlice makes living easy by aggregating information about the house and equipping roommates with tools that help iron out the details. Bills, supplies, and tasks are all together on a private network specific to your home. 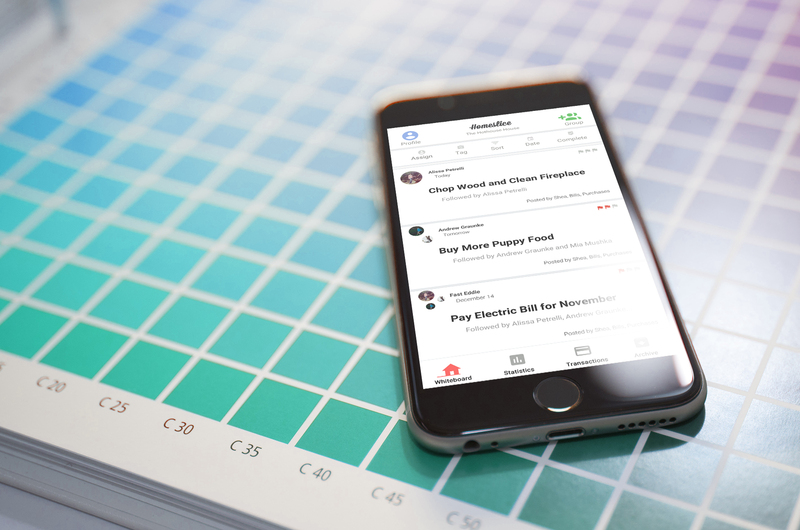 Bill splitting with Venmo and detailed archive make household finances easier than ever. 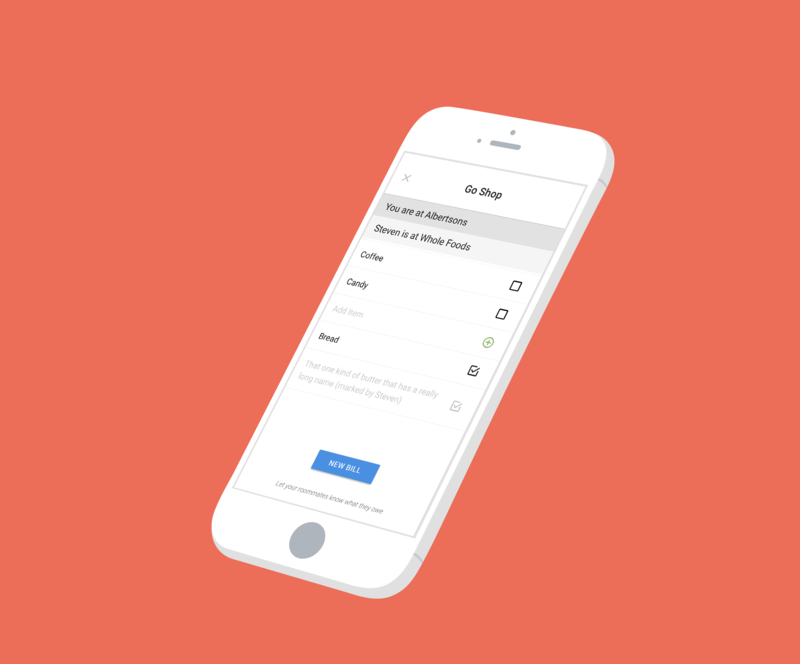 Notify your roommates where and when you shop for real-time collaboration on shared lists. Rotating assignees and recurring tasks delegate responsibilities automatically and on time. 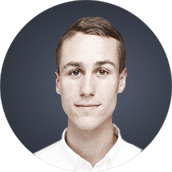 Andrew Graunke, Principal of No Capital LLC, joined the HomeSlice team for as a User Experience Consultant for project work. His primary focus was business and design. Behind HomeSlice the app, stands a team of builders, dreamers, investors, and advisors. Founded in 2013 by Shea Brucker with support from the Center for Innovation and Entrepreneurship at California Polytechnic State University, HomeSlice has a story to tell. CEO Shea Brucker founded HomeSlice in 2013 as a side project during his role as Senior Sales Associate for MINDBODY (where he brought in prospects for MINDBODY Exchange including Apple Inc., Jamba Juice, Overstock.com, and Orbitz). Met by instant demand and backed by the HotHouse Accelerator program in San Luis Obispo, California, Shea teamed up with Steven Feaster – a software developer with a portfolio of mobile apps and a 10 year history of mobile app development (including framework development for Palm OS) – in July of 2014. Together they prepped the HomeSlice MVP for hybrid development on Andriod and iOS leveraging a Cordova Plugin and the Google Polymer (Beta) framework. In February of 2015, investor Chris Noble – CEO of Matchfire Co – backed HomeSlice with seed-funding, personal involvement, and a push towards strategic brand partnerships. Shortly after Chris's investment, Kyle Murphy – Software Developer, and Andrew Graunke – User Experience Consultant, joined the HomeSlice team. Together, the HomeSlice team brought a synergy greater than the sum of its parts. With Shea's business expertise, Kyle and Steven's development bandwidth, and Andrew's passion for user experience, the HomeSlice team aggressively applied their unique strengths and expertise to a common goal – a revolutionary platform for household management that promotes communication and transparency within the home. By February of 2015, HomeSlice was active in over 2,000 homes, with over 6,000 users across 80 different countries with 500+ ratings on Google Play and 40+ on the app store. With hundreds of up-voted user-suggested features, the new team targeted pain-points and improvements to the widely adopted MVP. During Andrew's first two weeks with HomeSlice, he targeted on business goals, user-acquisition strategies, user-retention strategies, and helped Shea build a product-development road-map for HomeSlice that would maximize value for the addressable market in the coming months. HomeSlice provides a private social network for each house. Validated by user feedback, business goals, and user-data; improving the onboarding experience became the first design goal for Andrew and the HomeSlice team. Implementing of a philosophy of test first, guess first, and test again; Andrew aggregated months of user-data and matched it against business goals for Q1. With a goal of ––––––– new active users added by April 1st, Andrew reverse-engineered the numbers for February, confirming that onboarding with –– average invites per home would not only hit a target of ––– members per home, but would also put HomeSlice on track for its quarterly projected growth. A recurring theme on Uservoice – a HomeSlice user feedback forum – was difficulty adding roommates to the home. Andrew and the HomeSlice team concluded that this could be traced to HomeSlice doing little to suggest how send invites or facilitate the onboarding process for new users. Andrew and the HomeSlice team suggested that confusing onboarding was a primary contributing factor to the churn-rate measured for new-users unable to onboard roommates within the first week of downloading the app. In an effort to engage existing-users, and acquire new-users, Andrew and the HomeSlice team made onboarding a top priority for HomeSlice 1.3.0. Before version 1.3.0, onboarding users to a home relied on a new user navigating to "Menu" > "Settings" > "Home Settings" > "Invite Member" and the user entering emails manually (without help from saved contact information). After entering emails, neither the inviter or the invitee would receive confirmation of an invite being sent. Only by downloading the app and logging in with an email identical to the one entered by the inviter, could an invitee join the home. After a close look at the HomeSlice user-base and current mobile trends, Andrew built user-flows targeting text-message-based-invites and a weblink pin-pass-to-download technique, to streamline HomeSlice's onboarding experience, and to move the needle on successful invites per home. Immediately after the release of HomeSlice 1.3.0, user-data suggested a 300% increase successful invites per-home; putting HomeSlice on target for projected growth and it's target household size. Also suggested by user-data, version 1.3.0 users experienced higher levels of engagement shown by more screens, per-session, per-minute within the app. Once the design of version 1.3.0 was complete, Andrew Graunke and the HomeSlice team took a close look at household responsibilities where technology could support healthy and harmonious living. From an exhaustive list of features, bill splitting emerged as a power tool for every household. In February of 2015, HomeSlice's primary addressable market was 18-34 year old college students or graduates living independently. On the younger end of this spectrum, HomeSlice users are likely to be inexperienced with independent living. Prior research aggregated by CEO Shea Brucker suggested that seamless financial management is likely the most compelling technological solution for any household, especially for those with roommates living independently for the first time. In February of 2015, Shea and Andrew ran through a handful of use-cases, storyboards, and strategies. Transparency and flexibility emerged as defining principals for successful bill splitting within HomeSlice version 1.4.0. Not all bills are the same. One bill might be paid monthly with a variable amount. Other bills might be paid monthly with a fixed amount. Andrew and the HomeSlice team decided that communicating these bills effectively, calculating roommate shares flexibly, and requesting p2p repayments seamlessly were top priorities for HomeSlice 1.4.0. 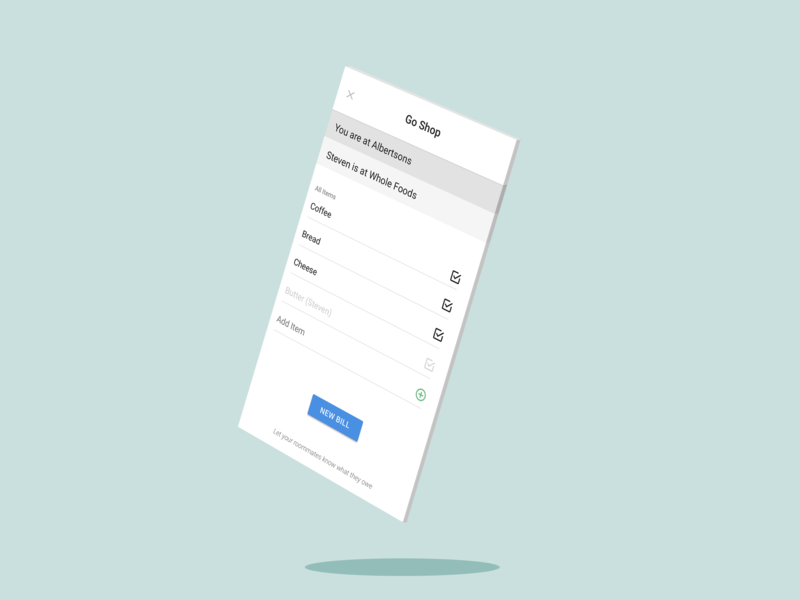 After a Design Studio with the HomeSlice development team, Andrew wire-framed screens and user-flows to demonstrate bill name, bill amount, a bill's paid or unpaid status, bill due date, and custom splits. Andrew built user-flows targeting account-holders and invoicees. Bill splitting requires complete transparency around who paid what and when. HomeSlice version 1.4 targeted this requirement via flexible bill splitting and a dedicated inbox for bills and invoices. Pictured below is user-flow for bill entry from an account-holder's perspective. A user enters a new bill, customizes the bill split between roommates, posts the bill, and archives the bill snippet. The above were built in Sketch and strung together in Invision resulting in a lightweight prototype that looked and felt close enough to the real thing to test. Incentivized by Pizza and Doughnuts, usability testers were scheduled for hour long sessions with the prototype to preform tasks, think out-loud, and surface problems and pain points created by the initial design. The usability testers were vetted via a simple survey to meet critical criteria found in the HomeSlice target customer segments: college age, living with 2 or more roommates, and smart-phone savvy. Each was given a prompt asking them to preform a custom bill split for a fictitious house. Each usability tester articulated pain-points from their life and household management tactics. Each pain helped shed light on where version 1.4.0 could add additional value. Each usability tester emphasized strengths and weaknesses of the prototype, and by recording each session, Andrew was able to iterate effectively on the original design and hone in on specific features and visual cues worthy of product development. Thanks to usability testing, clearly defined values from the primary HomeSlice customer segment became a guiding force for product development in which the right features got built right first. A handful of business-critical value assumptions were further articulated by usability testers and captured on camera. How important is Venmo integration? Is Venmo integration really worth the development costs? Are you sure we should include Venmo integration as shown in the prototype? How about those custom splits? Yes, those custom splits are worth it too. With a few minor tweaks and immediately following the usability testing of the 1.4.0 original prototype, a new logic emerged that was ready for product development. While Andrew finished polishing the visual cues for maximum legibility, the HomeSlice dev team charged forward on tested logic, confirmed for potency, that included a Bill Inbox with Invoices and Snippets, a Bill archive with Invoices and Snippets, a complete list of Bill Components (bill name, account holder, date, amount, invoicees, etc) and the celebrated Venmo integration. Thanks to Kyle Murphy's mad-dev-skills, Venmo integration was finished within 3 days. In a blazing 10-day-marathon, guided by CTO Steven Feaster, Steven, Kyle, and Eduard had the front and back-ends built and submitted for Android and iOS. That's fast! The screen below reflects what a user would see if they paid a few bills and still owed Daphne $5.00 for March Electric. What started as bills, roommates and all their peculiarities; looks simple in hindsight. Roommates need to know who-they-owe, what-they-owe, and what-they-paid. Thanks to business goals set by Shea, user experience design by Andrew, product leadership by Steven, Kyle and Eduard, as well as participation from HomeSlice customers and testers representing the HomeSlice target-market, HomeSlice version 1.4.0 split bills with ease. “UX is like polishing stones. Polished stones don't show force; just the cumulative effect.” Andrew Graunke, UX Consultant for HomeSlice, Inc. In HomeSlice version 1.4.0, in order for the Venmo button to appear, a different user must enter a bill and split that bill with the first user included in the split. Immediately after HomeSlice version 1.4.0 hit the app market, HomeSlice users starting showing signs of figuring-it-all-out. More downloads, higher engagement, and lots of taps on that Venmo button. 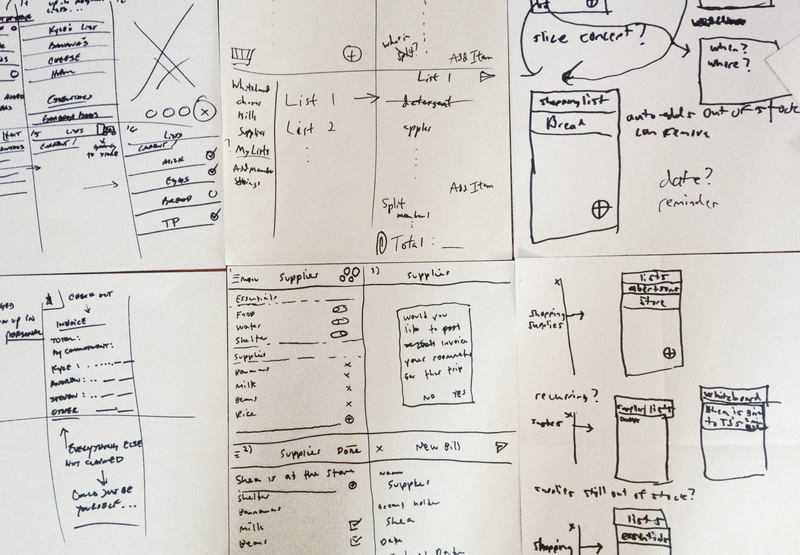 There's nothing quite like Design Studios with the entire company to kickstart the wireframing process. 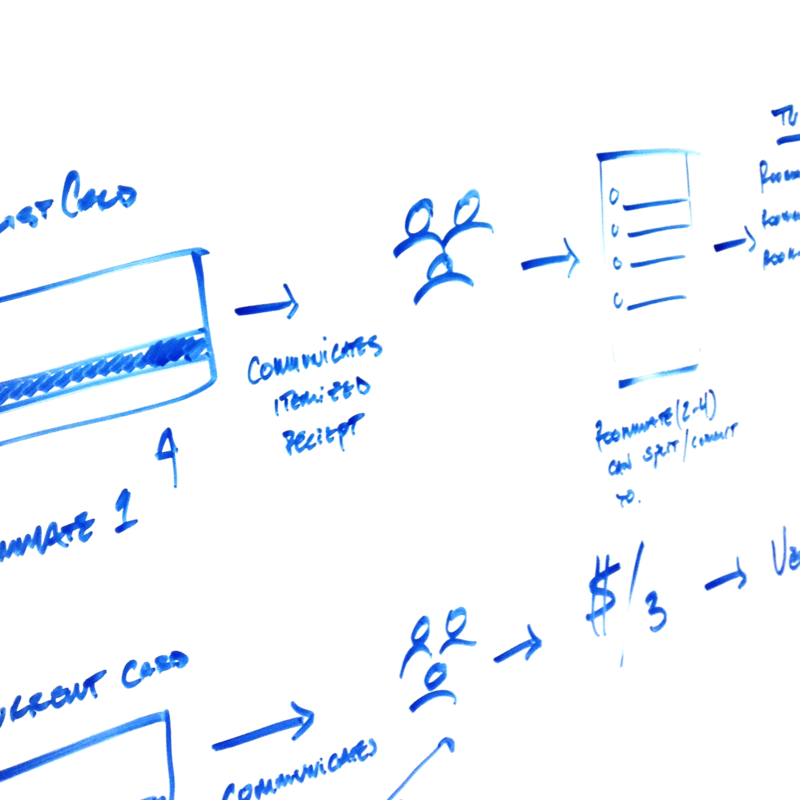 The wireframes below are the result of a 1 hour meeting with the entire company. For the first 10 minutes of the meeting, Andrew spoke to the "problem" faced by roommates seeking transparancy and collaboration around groceries and household items relevent to the entire home. After the first 10 minute intro to the "problem", the HomeSlice team was challenged to produce screens that tackle fringe-cases with risky and innovative solutions. This is the "divergent solutions" portion of a Design Studio. After 10 minutes of lighting-fast-sharpie-action, each member of the HomeSlice team was given the floor to quickly explain their divergent solutions. After everyone had a grasp on everyone elses "divergent solutions", the timer was set again, this time for 10 minutes of "convergent solutions". After a second 10 minutes of lighting-fast-sharpie-scribbles, the screens were again presented one-at-time, by the author to the entire team. To Andrew's surprise, what started as a single cool idea among many rose the top of the teams design intent - the go-to-the-store event. During the Design Studio for version 1.5.0, the HomeSlice team noticed that if a user could communicate that they were "going to the store", then users could add to their "to buy" list and pay the shopper back with the existing Venmo integration. This insight led to a list of supplies, followed by a push notification when housemates initiated shopping mode, with store names sent to each roommate, and a bill split option to finished it off. 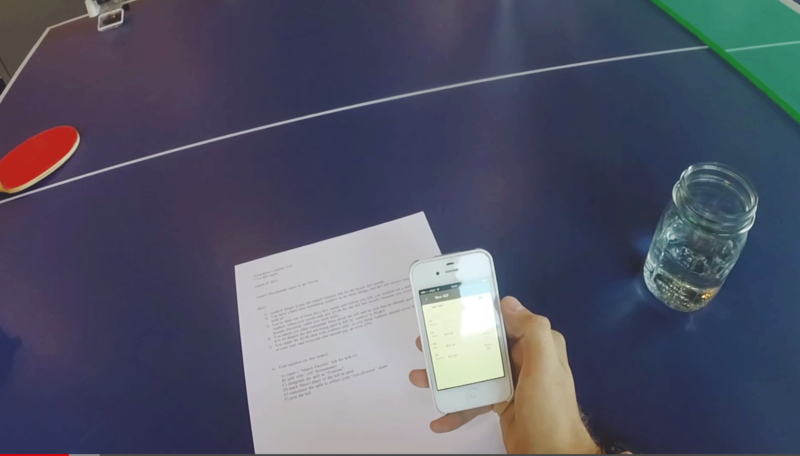 Shared supply lists were designed with extra care for the the business potential of "consensus intent to purchase" captured from households using the app. With the right UX, the HomeSlice team saw opportunities for seamless affiliate integration with major online retailers and brands. As did version 1.4.0, HomeSlice version 1.5.0 employed a model of Think, Test, Draw, Talk, Design, Test, Design, Develop, Launch. The Image below shows what a HomeSlice user would see on iOS while they initiated "Go Shop" mode. Before Andrew's engagement with the client, he designed a single-screen UI and put together the mock below. The difference between UX and UI is ripe for discussion. Both executed by Andrew Graunke, the screens above and this screen below might help clarify those distinctions. 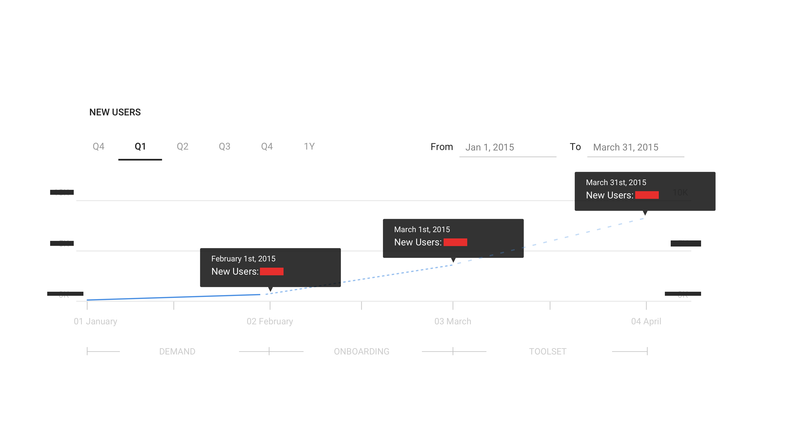 UX connects business goals to product development in service of a market. UX has to work, and work in every direction that matters. The screen below looks like project management software for roommates, right? In fact it's a small vigniet of a puzzel, not figured out. Long live product market fit. On April 23th 2015, during the last week of Andrew's consulting engagement, HomeSlice App announced series A funding and a partnership with Matchfire Co.